The young lady is holding two or three ears of corn in her hands, which she has chosen from a selection on display on a white cloth spread on the floor, and she is pointing at kernels of different colours, mentally counting them up. “Do you think this one is good enough? Can we win with this one?” – she asks to another girl, who is producing more cobs from a large bag, and adding them to the collection. “Take that one, that one is even better” – is the reply. I am attending an event called Muyu Raymi, a yearly seed fair held in Cotacachi, in the Imbabura province of Ecuador. Muyu Raymi is an important event for farmers: there they can bring their products, meet other farmers from different communities and exchange what they have brought. In addition to this, there are also competitions, where traditional food is offered for tasting and participants receive prizes. 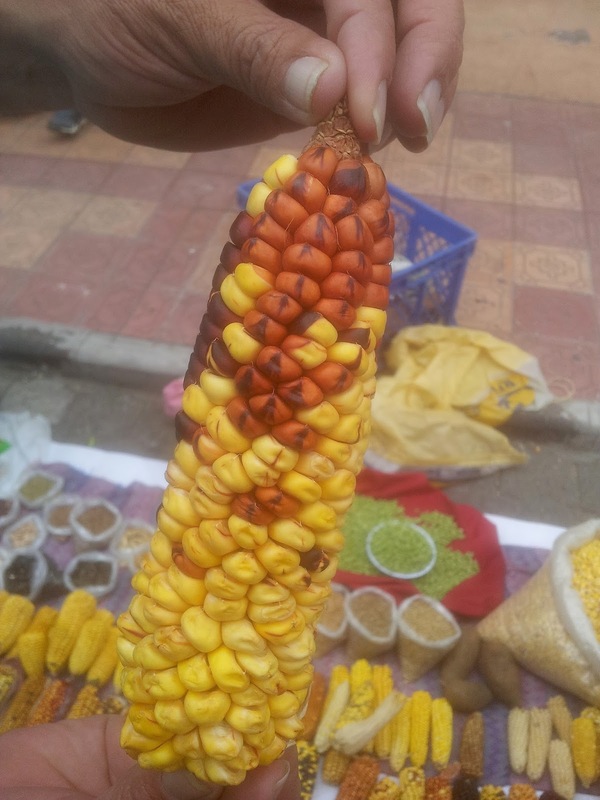 For example, there is a prize for the biggest ear of corn, and one for the ear containing the highest number of varieties. This year, the event was organized by the prefecture of Imbabura, the municipality of Cotacachi, and the Union of Peasant and Indigenous Organizations of Cotacachi (UNORCAC), in collaboration with the Instituto Nacional de Investigaciones Agropecuarias (INIAP), Ecuador’s national agri-research institute. Several international development partners contributed to this – IFAD being one of them, through the Bioversity International programme on Improving productivity and resilience or the rural poor through enhanced use of crop varietal diversity in integrated production and pest management. And this is what has brought me there. Pests and diseases account for a significant share of harvest losses each year, and in developing countries this can result in diminished food security and deterioration in the livelihoods base for many smallholders. It is intuitive to understand that monocultures are at high risk, as large surfaces planted to the same crop have uniform resistance and can be wiped out in the event of an outbreak. The underlying idea of the programme is that if different varieties of the same crop are planted at the local farm level, this will result in a reduction in pests and diseases and, ultimately, in an increase in productivity. Bioversity International and their partners are working on this concept in four countries (China, Ecuador, Morocco, and Uganda), and for six staple species: banana, barley, common bean, faba bean, maize, and rice. In Ecuador, two areas of work exist: one on banana and platano on the coast, and one in the mountains on maize and common bean. An evaluation of this programme is what brought me to the Muyu Raymi, where maize and bean are being exchanged. INIAP is the responsible agency for this part of the programme. Bean and maize varieties are so many in this area that it actually was a problem to have them all identified when the activities started. INIAP had to revise their initial idea of baseline assessment and organized a competition asking school children to spot all the different seeds in their parents' fields, and come back to the programme coordinators with samples and names. Now the programme has a community seed bank in Cotacachi, where crop mixtures are available for farmers to borrow, with the agreement that part of the harvest is returned to the programme, to be then further shared under the same conditions. In the meantime, scientists continue to be at work, to come up with further findings on resistance and productivity. So, the young lady mentioned before belongs to one of the households targeted by the programme. In case you were wondering, she did win and was able to walk back home with some new tools that, judging by the look in her eyes, promise to be helpful for her daily work in the fields. Before she started meticulously selecting the ear to present for the competition, I managed to ask the girl if at fairs of this kind she can really find new varieties she had not known of before. “Maybe not totally unknown” - she replied - “but for sure I was able to find varieties that I remember my grandparents used to harvest when I was little, and then have disappeared from my community. This is a good thing, isn't it?”.